Lightning and wind ignite wildfires on the East Coast of America. No one is prepared. The Firegale, a wind-blown blaze, sweeps westward scorching the landscape. Teenager Baeran Sheridan flees his home in New Hampshire guided by Solstice Dayton, a girl in Kentucky who reveals the future in lyrical visions. A connection forms, drawing the teens together as their world falls apart. But there is a worse fate than the flames. Survivors emerge caught in the Daze and decay in mind and body. After the final blue sky, the end of all Solstice and Baeran have ever known begins when teens burn, daze, or evolve. 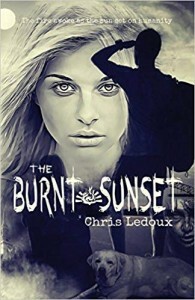 – Fans of The Walking Dead and The Hunger Games will devour this mash-up of the apocalyptic and the supernatural.